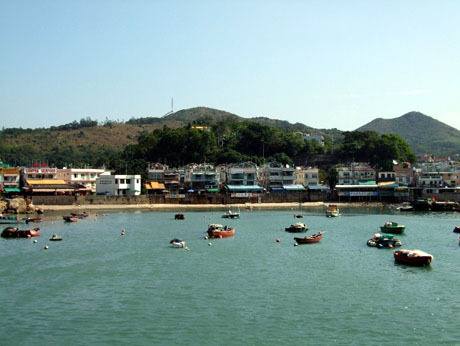 Lamma is situated only 3km off the south west coast of Hong Kong Island from which it is separated by the East Lamma Channel. The island is Hong Kong's third largest being about 6km in length and quite narrow being about 2.5kms at its widest point. 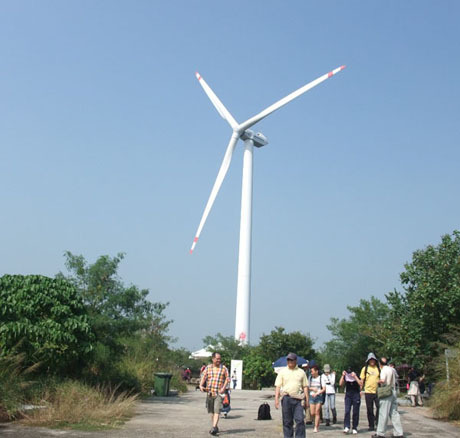 Apart from a large power station built in 1972 on the western side of the island which supplies energy to Hong Kong Island and a recent solitary wind turbine the island is virtually unspoiled and something of a contrast to its outlying island neighbours Cheung Chau and Peng Chau. It has a population of around 5,000 of which the vast majority live in the two main villages, Yung Shue Wan and Sok Kwu Wan. 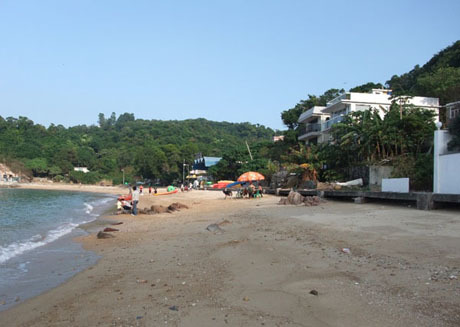 Lamma in Chinese means "the southern tree branch" and Lamma Island was originally known as "Bok Liu Chau". 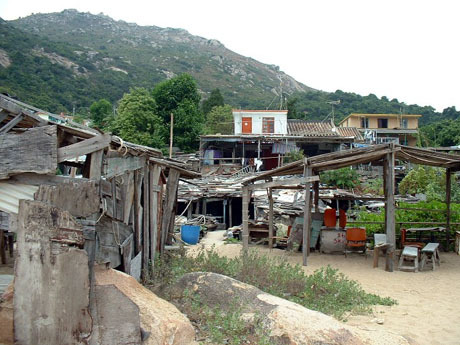 The island is very rural with some rugged scenery with granite hills dominated by the 353 metre peak of Mount Stenhouse (Shan Tei Tong) in the south, as well as tiny settlements and quiet beaches. As with its neighbouring islands there are no cars, just bicycles, motorised carts and miniature emergency vehicles. 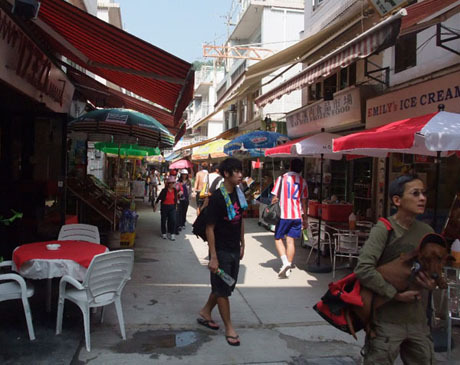 Lamma has a very “relaxed” feel to it with a slow pace of life which has made it popular with people seeking cheap accommodation and an alternative bohemian type of lifestyle. There are many western ex-pats in the community, some of whom have lived there since the “hippy/flower power” days of the late sixties/early seventies. 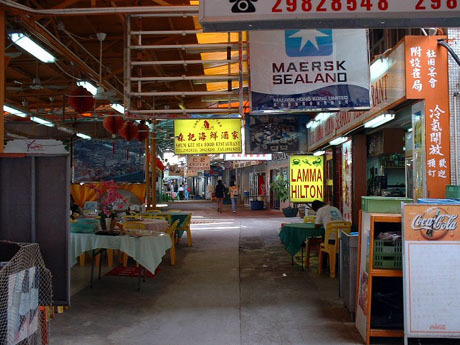 The island is well known for its seafood restaurants which are popular with locals, visitors and corporate guests of some of Hong Kong’s leading businesses. GETTING THERE – Lamma is served by ferries from Central Pier 4 on Hong Kong Island and from Aberdeen on the south side of Hong Kong Island. 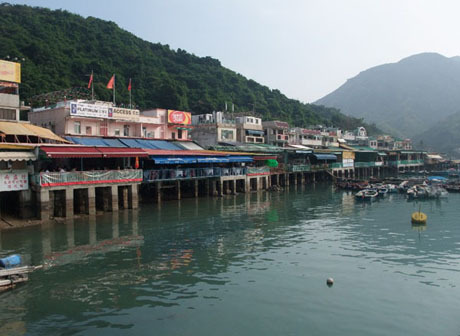 There are separate services to both of the main villages on the island, Yung Shue Wan and Sok Kwu Wan. The journey time is 27 minutes to Yung Shue Wan and 30/40 minutes to Sok Kwu Wan. Vessels are monohull and some of the boats have a small outside canopy-covered area at the rear of the upper deck. 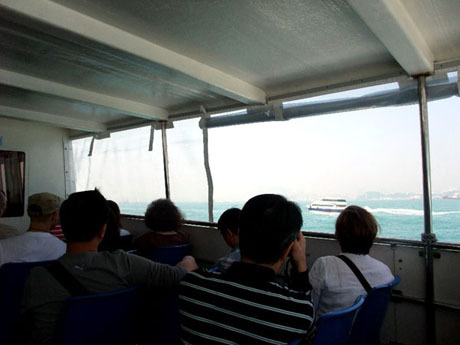 Some boats used on the ferry service to Lamma have an outside canopy-covered deck enabling passengers to enjoy the busy harbour activity on the journey. 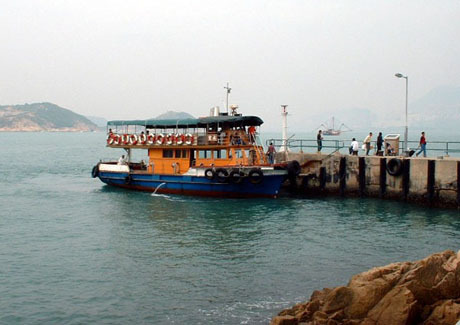 There is also a ferry service operating between Aberdeen and Yung Shue Wan via the small village of Pak Kok Tsuen on the northern coastline of Lamma. 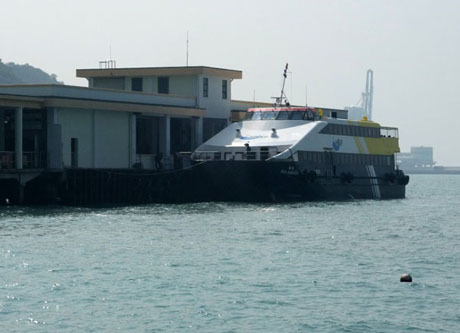 Since August 2008 this service has been operated by Tsui Wah Ferry Service (HK) Ltd and the journey from Aberdeen to Yung Shue Wan takes about 40 minutes (25 minutes to Pak Kok Tsuen). 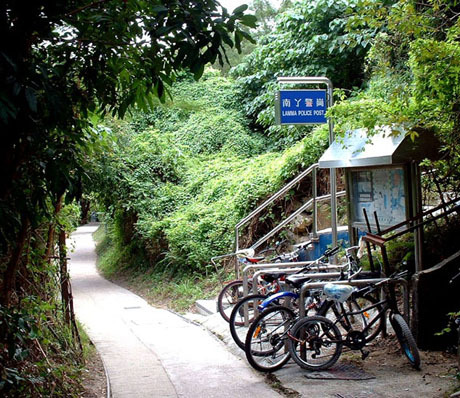 FAMILY TRAIL – a popular family trail across the island links the two largest villages, Yung Shue Wan in the north and Sok Kwu Wan in the south. The 3km trail which is along concrete paths all the way takes about 60/70 minutes to walk and provides a wonderful opportunity to explore the island scenery. From Yung Shue Wan take the path around the harbour side and through the narrow and congested main street lined with seafood restaurants and small shops. By a prominent “Shell Gas” sign take the signed path on the left. The path leads past more shops and residential dwellings and shortly after crosses a wide service road (which runs between the power station, service reservoir and Lamma Winds). 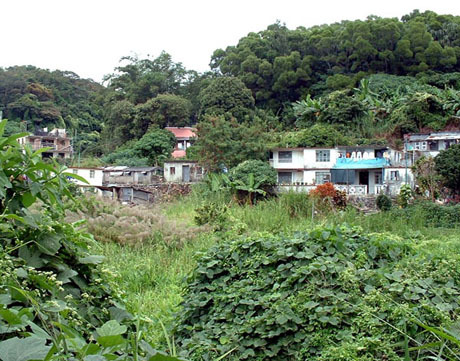 The built-up area now disappears as the path crosses marshland, tall vegetation and the rather delapidated village of Long Tsai Tsuen. After Long Tsai Tsuen the path begins a gentle ascent before crossing another service road leading to the power station before descending past the former Lamma Police Post to Hung Shing Ye Beach. 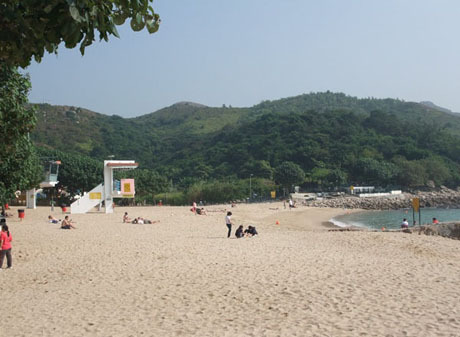 Hung Shing Ye is a popular sandy beach partially sheltered by trees and a favourite haunt of windsurfers but sadly spoiled by being in the shadow of the power station. There is a beach café, barbecue area, changing rooms, showers and toilets. The beach becomes busy during weekends and holidays. From this point the trail becomes much more tranquil and climbs quite steeply to a pavilion and viewpoint with panoramic views of the coastline, grassland, rock strewn hills and Mount Stenhouse ahead. 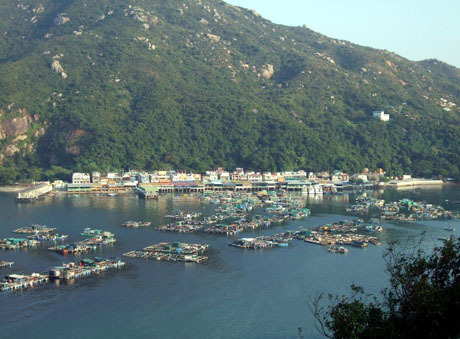 The trail continues along a ridge and soon after passing the intersection with a path up to the Lamma Youth Camp, Sok Kwu Wan Bay and its numerous fish farms, Sok Kwu Wan village and the south side of Hong Kong Island come into view across the East Lamma Channel. Below the trail is a disused cement works, a minor blemish on an otherwise quite idyllic scene. Shortly a path off to the right of the trail leads down to Lo So Shing Beach, set in a scenic cove and well worth a visit. This beach is also sandy and has showers and changing facilities and there is a barbecue area with solar-powered floodlighting located on a small rocky outcrop on the edge of the bay. 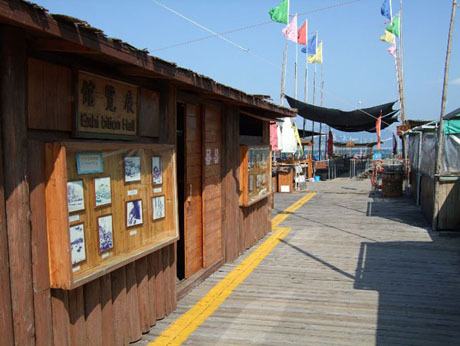 The main trail descends to Lo So Shing village with its tiny houses and past a pavilion before passing an abandoned school and following the bay alongside a sandy beach. 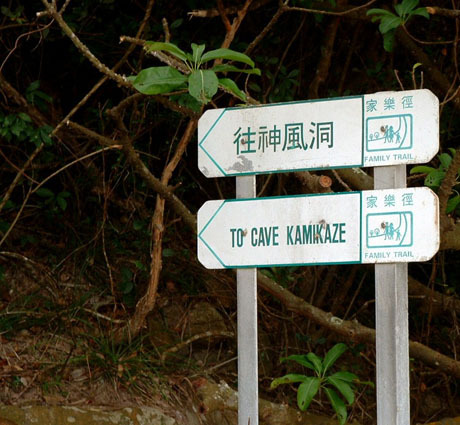 Beyond Lo So Shing the trail passes Kamikaze Cave where during World War II the occupying Japanese troops are reputed to have hidden speedboats with which to make a suicidal escape when the Allied forces reoccupied Hong Kong. The trail follows a narrow causeway across mudflats and a small inlet before reaching the Tin Hau Temple at the entrance to Sok Kwu Wan. The temple was built in 1826 but following a fire in 2004 has been splendidly refurbished. 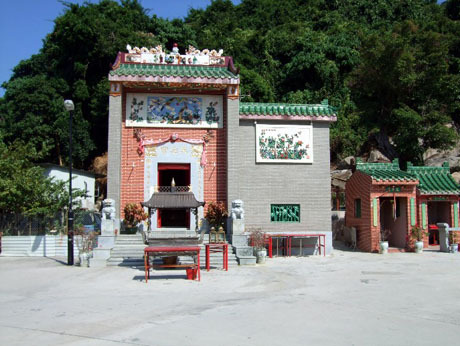 This is one of three Tin Hau Temples on Lamma, the others being at Luk Chau Shan and Yung Shue Wan. Sok Kwu Wan’s main street is lined with canopy covered waterside seafood restaurants of which the best known is Rainbow Seafood Restaurant which several premises, having expanded to take over some of the other restaurants in the village These restaurants are extremely busy at weekends and are popular destination for entertaining corporate clients of some of Hong Kong’s major businesses. Just beyond the restaurants is the pier for ferries to Central and Aberdeen. 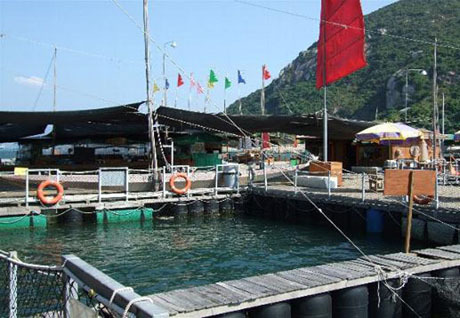 LAMMA FISHERFOLKS VILLAGE – located on a raft in the bay amongst the fish farms lies Lamma Fisherfolk’s Village, opened in 2007 to showcase the local fishing culture and history of the fishing industry in Hong Kong. The village comprises an authentic fishing junk, traditional dragon boats, feeding rafts, exhibition hall, themed folklore booths, fishing rafts and dwellings. There is an opportunity to witness and participate in various activities including water bombing and net throwing, sail raising and “funny” hookless fishing. 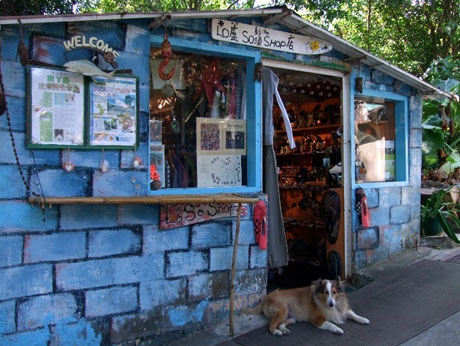 The village is open daily from 10am to 7pm. Tickets can be obtained from the booth on the main street amongst the seafood restaurants and fast boats from Sok Kwu Wan Public Pier number 1 (not the ferry pier) transport visitors to the village in about one minute. There are two types of ticket, Package Ticket HK$128 (HK$88 child and seniors) which includes game tickets, snacks and a discount voucher or General Ticket HK$80 (HK$60). EXTENDED FAMILY WALK – some of the best scenery on Lamma lies beyond Sok Kwu Wan and continuing on Family Trail for about one hour leads past more beautiful bays, tiny and partially abandoned villages and the lower slopes of Mount Stenhouse before completing a circular route to emerge by the Tin Hau Temple at Sok Kwu Wan. Leaving Sok Kwu Wan the path climbs above the bay with its many fish farms then heads around the rural tree lined headland before reaching Mo Tat New Village which has several modern dwellings and holiday accommodation. A path and steep steps lead down to Mo Tat Wan, another secluded bay with beachside Mediterranean restaurant. From the pier at the end of the bay there is a kaido ferry service to Sok Kwu Wan and Aberdeen operated by Chuen Kee Ferry Ltd. Continuing along the trail the path leads through Mo Tat Old Village then drifts away from the coastline before reaching the remote and mostly abandoned tiny village of Yung Shue Ha at one end of a beautiful unspoiled sandy beach in Shek Pai Wan Bay. At the other end of the bay the trail turns inland to Tung O, another mostly abandoned tiny village which is where the film star Chow Yun Fat was born and raised and members of his family still live on the island. A path off the trail just before the start of Tung O village leads across marshland to Sham Wan where the endangered green turtles come ashore to lay eggs on the sands during July to August (visitors should stay away during this time). Past Tung O the trail climbs up to a shelter and pavilion at the foot of the slopes of Mount Stenhouse and then descends quickly via a cemetery and a flight of steps which emerge near to the Tin Hau Temple at Sok Kwu Wan. 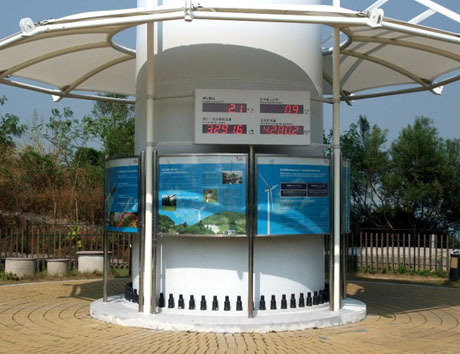 LAMMA WINDS – This single 800kw wind turbine operated by Hong Kong Electric was built in 2006 and is Hong Kong’s first commercial wind power station. 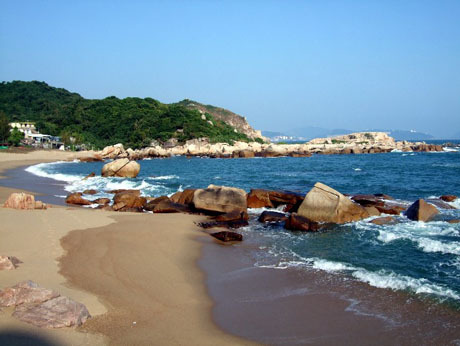 It is prominently located at Tai Ling, high on the north-east side of the island. At the base is an exhibition centre and instrument displays from which the real-time performance can be observed. The station is open to the public daily from 07-00 to 18-00 and admission is free. To get there follow the family trail (described above) from Yung Shue Wan towards Sok Kwu Wan. Where the trail crosses a wide concrete service road (just before Lamma Police Post) follow this road uphill and Lamma Winds is right at the top. The walk from Yung Shue Wan Ferry Pier takes about 40 minutes. 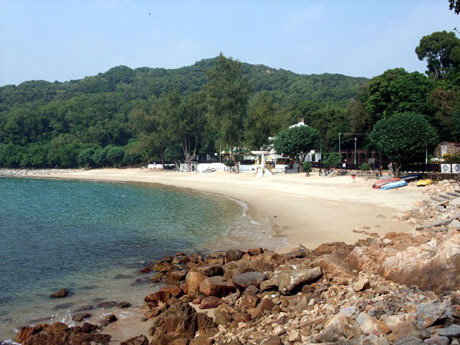 CONCERTO INN, located right on the beach at Hung Shing Yeh has well equipped modern rooms. 20 minute walk from the ferry pier at Yung Shue Wan along the main path (family trail) towards Sok Kwu Wan. THE BAY, located on the beach at Mo Tat Wan and served by kaido ferries from Aberdeen, this Mediterranean restaurant has rather spartan double rooms for rent.